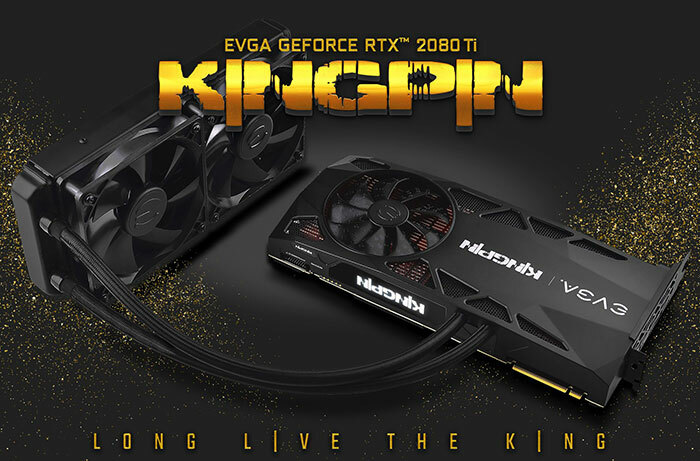 After several teases over the last few months, EVGA has finally taken the wraps off its GeForce RTX 2080 Ti KingPin Gaming edition, and listed the card on its website. You can check out the full product pages here, however the purchase button is currently just a notify button and it will be available to EVGA Associate Members first. The included AiO cooler features a 30mm thick, 240mm long, radiator with dual 120mm fans. On the graphics card side of things there is a 100mm fan mounted to a full metal heatsink, an Asetek gen 6 pump, copper direct die cooling plate, and copper modular VRM heatsink. If you remove the supplied AiO cooler you will find that the card has been designed for open loop enthusiasts in mind, and it is built to fit with the EVGA Hydro Copper block and aftermarket solutions. EVGA even supplies an additional OLED bracket for Hydro Copper compatibility. 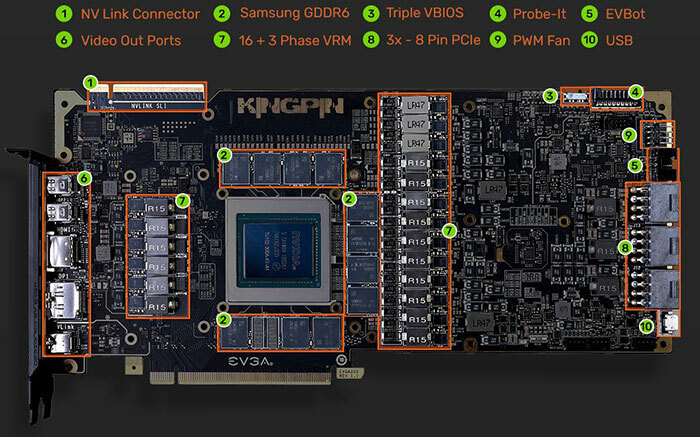 EVGA says that another star overclocker, Illya 'TiN' Tsemenko, contributed to the design, with a custom 12-layer PCB plus the Probe-It header for real-time GPU monitoring, and EVBot header for real-time power tuning. Tin also helped with the triple BIOS, 12x onboard iCX temperature sensors, voltage monitoring with real-time OLED readout, and diagnostic LED setup. The on-shroud OLED display is a boon for real-time stats and message monitoring. It can be configured to show real-time Voltages, Temperatures, Clocks, Power Consumption, and GPU Utilization - as well as self-test and diagnostic results. 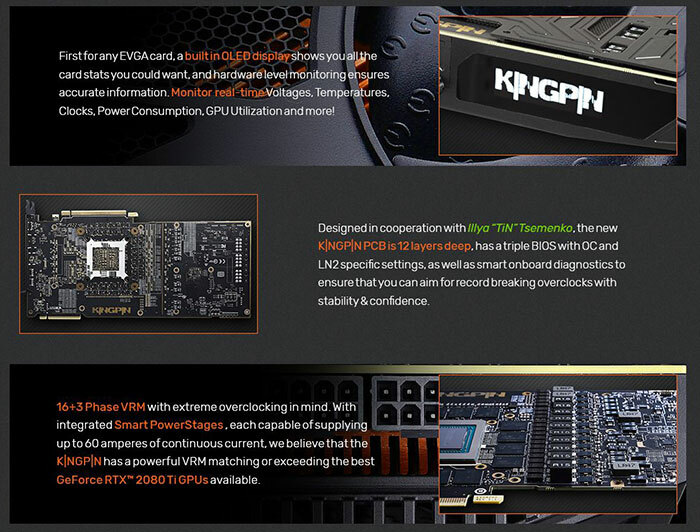 The 16+3 phase VRM has been designed especially for overclocking high jinks. This important component includes dual MP2888A controllers supporting sixteen MP86956 DC converters for the 60 ampere Smart PowerStages for the GPU, and three for the 60 ampere Smart PowerStages for the memory. There are three 8-pin PCIe power conenctors to supply the necessary current. 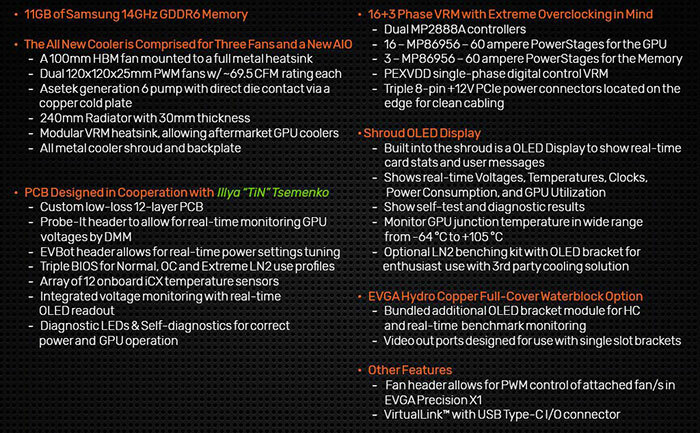 In total there is a >520W TDP rating for the card with the overclocking BIOS choices. Out of the box the EVGA GeForce RTX 2080 Ti KingPin offers a 1,770MHz GPU boost clock, compared to the Nvidia branded FE model which runs at 1,635MHz GPU boost by default. However, anyone buying this card is not likely to stick with the default OC for long. The EVGA GeForce RTX 2080 Ti KingPin is listed at $1,899.99 with a limit of two cards per household. The price is quite a hike above most other GeForce RTX 2080 Ti examples, for example an EVGA GeForce RTX 2080 Ti Black Edition Gaming sells for under $1,200 on Amazon.com at the time of writing. oh.. I was proper ready for 3 of these bad boys…..
Only £1'899.99 in the UK. Yours for your first born child or two other children! Two per household. Does that mean that they're making a loss on them or does it mean that the power grid won't be able to handle it?